Picture it: a crackling fire, the smell of a decorated spruce and food. This is Christmas. And what’s best of a traditional unconventional italian dessert? Nothing, because dessert is the most important meal of the day. And the most important thing is that Panettone with balsamic vinegar IS REAL. 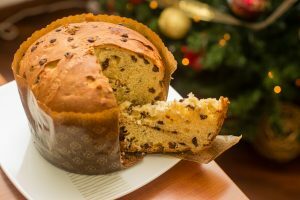 Panettone, or how the people from Milan pronounce it Panaton, is a typical type of loaf bread with raisin and candied fruit, that italian people always eat during Christmas time. Due to its popularity, the consumer can easily find different version of this dessert: from the super tasty chocolate, to the sicilian pistacchio. But the version that connects tradition with innovation, is definitely the one with balsamic vinegar of Modena. Baked for the first time in Modena by Ivan D’Avino, this Panettone is weirdest, and tastiest, type, thanks to its dough, which contains 72% chocolate, and the cream, with balsamic glaze. The idea behind this dessert is to merge tradition and innovation and creating a new tradition. New tradition is an oxymoron but is definitely what you have when you bite this Panettone. Balsamic vinegar of Modena moved from being just a dressing, to being the main ingredient in your cooking… Isn’t it great? This improvement of a traditional recipe became popular abroad. Such as Balsamic Vinegar of Modena, the holiday version, gained spotlight. This idea of injecting the black gold everywhere is fully appreciated. For example, you can easily buy it online in specialized platforms, which sell gourmet food. You don’t need to come to Modena to eat it. Just click, wait and, of course, eat. So, if you are curious on a food that’s new tradition, and don’t want to be disappointed try the Panettone with balsamic vinegar. Traditional Balsamic Vinegar of Modena, the secret of the aging process: how much do you know about it?